In the saloon of Covent Garden Theatre, Tom and Jerry stand in the center surrounded by women in elegant evening dress, “gay Cyprians,” or courtesans (Egan 173). On the left sits a woman in a rigint-habit. Behind the crowd is a recess with a table for refreshments: an intricate pot, a tea cup, a tray. 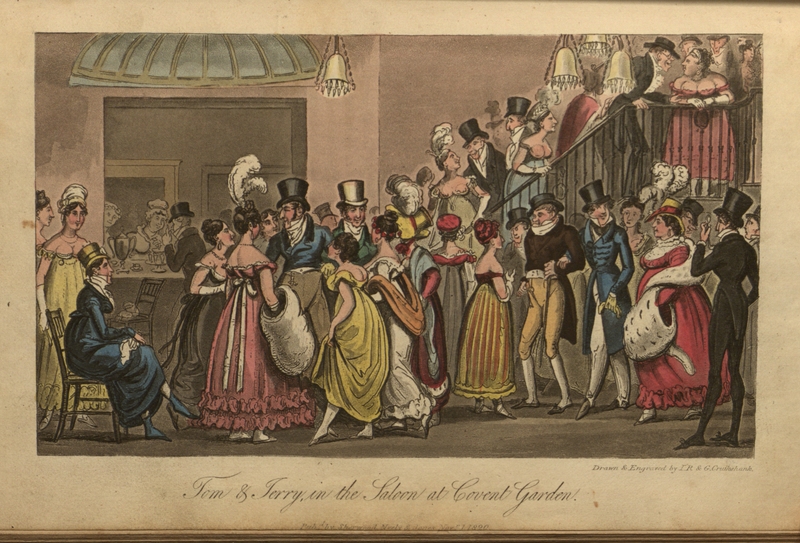 On the left men and women socialize, apparently walking: two men walk arm-in-arm, and an overly-dressed woman with large plumes on her hat and an ermine stole stands to the side. In the background, men and women talk and mingle, ascending and descending the staircase. Life in London: or The day and night scenes of Jerry Hawthorn, Esq., and his elegant friend Corinthian Tom . . .
Royal octavo, 8 volumes, in twelve monthly parts (Oct. 1820-July 1821), and subsequently in picture boards (A.M. Cohn Bibliographical 74, A.S.W. Rosenbach Catalogue 67). Located northwest of the Strand in Westminster, London, Covent Garden was originally the convent garden of the Benedictines of Westminster. It passed to the Bedford family and was developed in the 1630s as the first residential square of its kind by Inigo Jones. The Covent Garden Market operated as the main fruit, flower, and vegetable market for more than three hundred years, formally established “forever” in 1670 by Charles II. It was also “the haunt of coffee-house literati and the theatrical demi-monde” in the eighteenth century (C. Thubron, Royal Opera House 12). Opening in 1732, the Theatre Royal presented plays, pantomimes, and operas, which mounted and was managed by noted actors such as John Philip Kemble and Charles Kemble. It was established as the Royal Opera House in 1847. It burned down in September 1808 and was rebuilt the following year, and again in 1856 and rebuilt in a year. The costs of rebuilding the theatre not only raised prices, but also changed the seating arrangement of the auditorium: a number of inexpensive seats were replaced by more pricey boxes, leading to the “O.P,” old price, riots (M. Baer Theatre and Disorder 1). The auditorium was horse-shoe shaped with three tiers of twenty-six boxes each; each box contained ten seats in three rows. On the third tier were the “private boxes,” which had an attached retiring room and special access by a separate staircase (H. Wyndham, Annals I.324). After some alterations in response to the O.P. riots, the house held 2800 persons when full (H. Wyndham, Annals I.337).. In 1888, the Royal Opera Company took residence there (C. Thubron, Royal Opera 12; “Covent Garden” EB). George Cruickshank and Pierce Egan. The New Pedestrian-Equestrian Extravaganza and Operatic Burletta, in Three Acts of Gaiety, Frisk, Lark and Patter, called Tom and Jerry, or Life in London. Finding the drama onstage utterly uninteresting, Tom and Jerry head for the saloon where they are surrounded by “Cyprians,” or courtesans. By turning their backs to the viewer and centering their gaze and attention on the two dandies, these Cyprian maids construct Tom and Jerry as a spectacle. By locating the spectacle of society outside the theater house and in its saloon, Egan’s text and the Cruikshanks’ illustration legitimize and celebrate errant viewing practices, in particular fashionable spectatorship. The illustrations of Life in London are considered to be the first important “non-caricature work” of George Cruikshank (J. Wardroper Caricatures 19). As such, it is the beginning of George Cruikshank’s turn from political caricature and his first success in “depicting the drama and drollery of contemporary life in a style that was not caricature but was derived from it” (J. Wardroper Caricatures 102). Contemporary and modern day critics debate that the characters of Tom, Jerry, and Logic are based upon Robert and George Cruikshank and Pierce Egan, the sporting journalist. Moreover, Robert Cruikshank allegedly was the originator of the concept and story. The speculations regarding the inspirations for Tom and Jerry are based on the fact that the Cruikshanks enjoyed the “company of pugilists, journalists, jolly tars, gamblers, Grub Street hacks, Bacchanalians, and actors” (R.L. Patten “GC” DNB). Egan’s story and the accompanying illustrations by the Cruikshanks (it is noted that Robert was mainly responsible for them) quickly became an enormously popular success. It was published in monthly installments then as a book. The story was set to music, dramatized in more than a dozen stage versions. George Cruikshank even joined in the fray, collaborating with Egan in mounting at the Aldephi Theatre The New Pedestrian-Equestrian Extravaganza and Operatic Burletta, in Three Acts of Gaiety, Frisk, Lark and Patter, called Tom and Jerry, or Life in London (J. Wardroper Caricatures 19). George and Robert Cruikshank designed and painted the scenery, as well as contributing a color plate of the pony race which was ran by real ponies on stage when the songs were published (J. Wardroper Caricatures 19). Life in London was also quickly pirated: “the first pirated edition, by Catnach, was apparently on the streets within twelve hours of the original” (W. Feaver GC 11). Moreover, Tom and Jerry became bywords in London society where tailors advertised “Corinthian” and “Tom and Jerry” patterns. Their images also appeared on tea trays, snuff boxes, fans, and screens (M.D. George Catalogue X.14320). Tom and Jerry decide to take in the entertainment of the London theater, and it is highly significant that their night on the town includes at stop at the saloon of Covent Garden rather than in the theater house itself. Tom and Jerry arrive at the saloon after having been at Drury Lane Theater where “the performances did not operate on their feelings as a source of attraction” (P. Egan Life 172). Thus, they do not watch but rather “took a glimpse at the play, but as they did not go for any thing like criticism on the abilities of the actors, or to descant upon the merits of the pieces, it was merely a glimpse indeed” (P. Egan Life 172). This singular, negligent glimpse that Tom and Jerry give to the stage is starkly contrasted by the attention they direct to the boxes and galleries of the house. Their aim is not to watch the spectacle but to watch society in searching for acquaintances among the spectators. Thus, like Dr. Syntax, Tom and Jerry are engaged in errant spectatorship, though arguably one that was not only socially acceptable but also fashionable. Finding no acquaintances and no interest in the play, Tom proposes a change of venue to Covent Garden where they find entertainment in the saloon, never making it to the house. At the saloon, Tom and Jerry are accosted by “gay Cyprians,” courtesans, who berate and welcome Tom back after a long absence from Covent Garden. Jerry is impressed by the sight and all that goes on. Building up the spectacle of the saloon, Tom points out various society figures and explain their history such as an old S-shaped man who is a fallen fashion icon (the notably old gentleman in front of the stairs in the illustration) and a tall thin man (most likely the man in black on the left) who preferred Slaveys, servant girls. Implicit in this episode of looking and its accompanying illustration with its staircase is the notion that Rowlandson made famous in his Exhibition, Stare Case: that the theater like the exhibition is an occasion for looking at and being looked at in society. By locating the spectacle of society outside the theater house and in its saloon, Egan’s text and the Cruikshanks’ illustration legitimizes and celebrates Tom and Jerry’s errant viewing practices. Baer, Marc. Theatre and Disorder in Late Georgian London. Oxford: Clarendon Press, 1992. Borer, Mary Cathcart. Covent Garden. London: Abelard-Schuman, 1967. Cohn, Albert M. A Bibliographical Catalogue of the Printed Words Illustrated by George Cruikshank. London: Longmans, Green, and Co., 1914. Egan, Pierce. Life in London: or, The day and night scenes of Jerry Hawthorn, Esq., and his elegant friend Corinthian Tom: Accompanied by Bob Logic, the Oxonian, in their rambles and sprees through the metropolis. London: Sherwood, Neely, & Jones, 1823. Feaver, William. George Cruikshank: [Exhibition held in] London, Victoria and Albert Museum, 28 February-28 April 1974 . . . London: Arts Council of Great Britain, 1974. George, M. Dorothy. Catalogue of Political and Personal Satires Preserved in the Department of Prints and Drawings in the British Museum. 11 vols. London: British Museum Publications Limited, 1978. -----. George Cruikshank’s Life, Times and Art. 2 vols. New Brunswick, NJ: Rutgers University Press, 1992. Pyne, W.H. and William Combe. Microcosm of London, or London in Miniature. 3 vols. London: R. Ackermann, 1904. Rosenbach, A.S.W. A Catalogue of the Works and Illustrations by George Cruikshank and Isaac and Robert Cruikshank in the Library of Harry Elbin Widner. Philadelphia: privately printed, 1918. Thubron, Colin. The Royal Opera House, Covent Garden. London: Book Club Associates, 1982. Wardroper, John. The Caricatures of George Cruikshank. Boston: David R. Godine, 1978. Wyndham, Henry Saxe. The Annals of Covent Garden Theatre from 1732-1897. 2 vols. London: Chatto & Widnus, 1906.